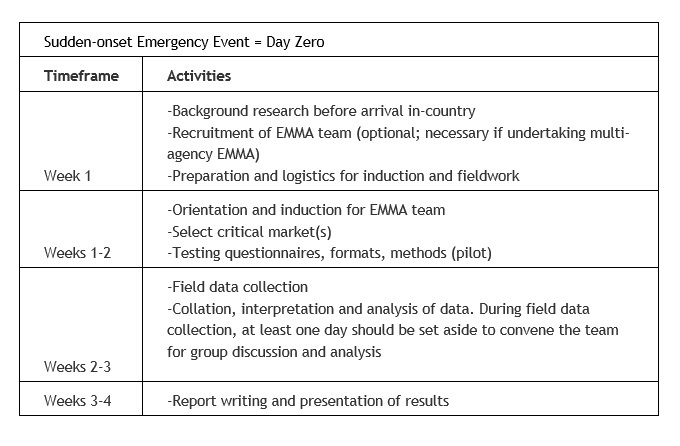 This page focuses on the processes of organizing an EMMA exercise, such as getting agency buy-in, defining the scope and objectives of the exercise, assembling the assessment team, developing a communications plan and arranging the logistical aspects of the assessment. Very often, the person who undertakes these tasks is not the same person who prepares for and facilitates assessment team workshops, oversees data collection and analysis and writes final reports, though of course it can be. These latter aspects are discussed further on the Leading an EMMA page. At the moment, there is no comprehensive guidance document on the numerous steps involved in planning an EMMA or PCMA assessment; that said, the revised PCMA guidance document (to be released shortly) contains some relevant information, especially about defining the scope of your exercise and the composition of the assessment team. Another resource that may be useful is the initial version of the EMMA Leader's Guide, which was released in October 2011. The Leader’s Guide is a compilation of lessons learned from early EMMAs exercises, tips from EMMA leaders and some basic document templates. Though there are no immediate plans to update the guide, there is always the possibility of doing this in the future. If you have input you would like to see reflected in the guide, or if you have any tips from your own experiences you'd like to share on this page, please contact emmawebmaster [at] rescue.org. Additional resources that may be useful for people planning to lead an EMMA/PCMA include examples of TORs used for assessments and for recruiting assessment leaders and other team members, sample budgets and sample exercise timelines, all available on the Resources page. Some common considerations for those planning an EMMA (or PCMA) exercise are discussed in further detail below. Since the EMMA Toolkit was released in 2010, numerous people have developed the competencies and experience needed to lead EMMA assessments, and today a number of consultants are available for these types of assignments. Experienced EMMA leaders should be able to lead PCMAs as well, since the process and concepts involved are very similar. The best ways to find a good consultant are through word of mouth (by asking other agencies that have recently carried out similar exercises for recommendations) and by sending a TOR to the Markets in Crises dgroup listserve. That said, every market assessment should be viewed as an opportunity to build the skills of promising staff within your own agency, and ideally each agency should have a growing pool of staff who are capable of leading EMMAs and PCMAs themselves. It is important to have a team leader with experience. As for team members, it is essential to have [people] with analytical skills and a strong local connection,[who] understand local power dynamics and are capable of reading between the lines during interviews and [explaining] the local context. It can take from one to three weeks to conduct an EMMA, depending on the geographic areas and critical market systems to be covered and the availability of resources like staffing and vehicles. The timeframe may also vary depending on how much information already exists regarding the crisis-affected population's needs and the critical market systems being studied and the assessment leader's familiarity with the context. Bear in mind that some time should be allotted for defining the scope of the assessment with knowledgeable local stakeholders and for recruiting the assessment team (including the assessment leader) before the assessment team assembles on the ground. One sample timetable for EMMA assessments can be accessed here; other sample timetables are available on the Resources page. Manage expectations. You only have a few days for EMMA in the field. [Remember that] if you do an EMMA now you have to monitor [markets] on a regular basis and update the results [when necessary]. EMMAs have been conducted for as little as $5,000 USD and as much as $30,000 USD, excluding staff time. Hiring a consultant and/or flying in expatriate technical staff to help facilitate the exercise, if needed, is usually the single most costly part of an EMMA. Good preparations before deployment will lower costs by reducing the number of days needed in the field. Vehicles are critical for an EMMA. In the limited amount of time available for data collection, any time wasted wrangling drivers and vehicles can quickly have a significant impact on the quality and quantity of data collected. It is often more efficient for the assessment team to split into smaller groups, each covering different geographic areas or types of actors, during the field research, and an extra vehicle or two can facilitate this. If participating agencies are not able to contribute vehicles for an assessment, extra money spent on vehicles and logistics may be well spent and can actually decrease the total cost if it reduces the length of stay for the EMMA team and/or consultant in the field.